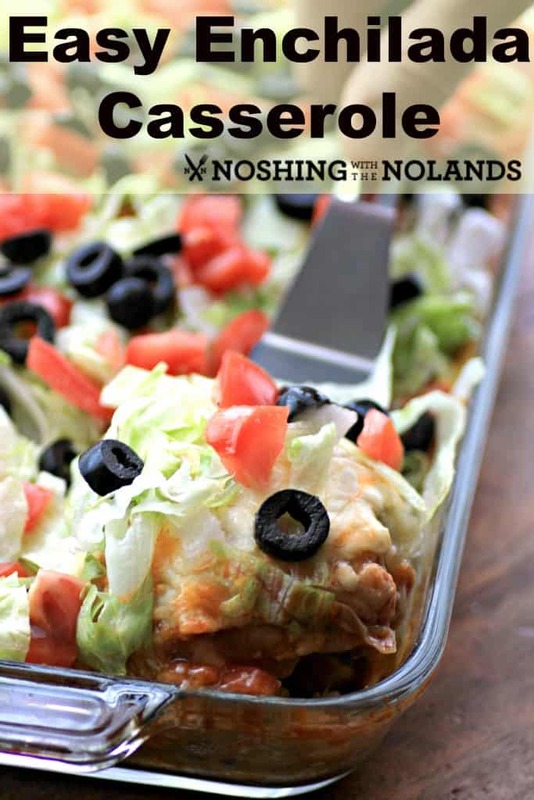 I love making Enchilada Casseroles and so does my family. Plus Cinco de Mayo is just around the corner! Not only are they easy and delicious but feed us for a few days as leftovers and even make a great lunch. I have already made on the site, Leftover Turkey, Sausage Enchilada Casserole, Chicken and Chorizo Enchilada and Enchilada Casserole. Easy Enchilada Casserole I changed up a bit from Enchilada Casserole. I really liked the toppings of lettuce, tomato and black olives, it is like having your salad right there with your meal. I changed up the recipe a bit with different kinds of enchilada sauce. I think if I went with all mild green sauce it wouldn’t have enough umph for me, but all medium red sauce would be too spicy for our daughter. A nice comprimise was to use both, just the right heat and flavor. 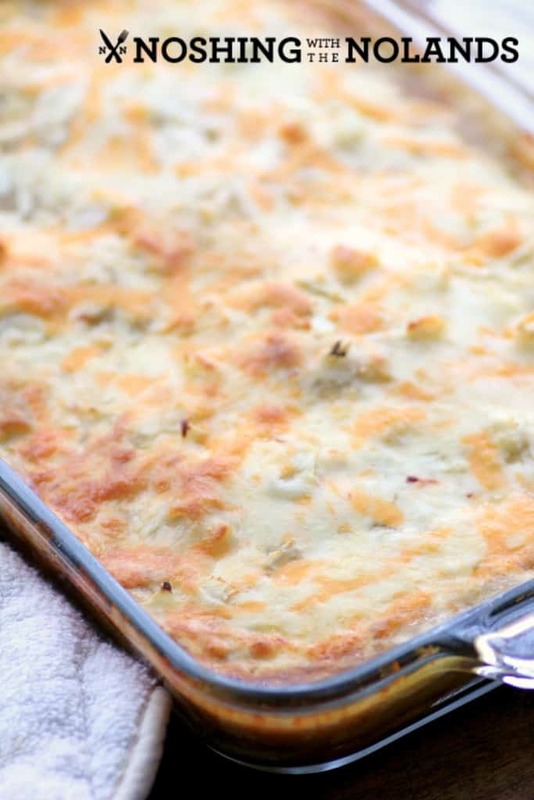 Love a great cheesy topping, all melty, gooey and just the right amount of browning. Then topped with lettuce, tomato and black olives. I know you want to dive right in!! I like to use flour tortillas, they do get a bit softer but I like the flavor compared to corn. You can most certainly use corn tortillas and a lot of them are gluten free which helps if you are eliminating that from your diet. 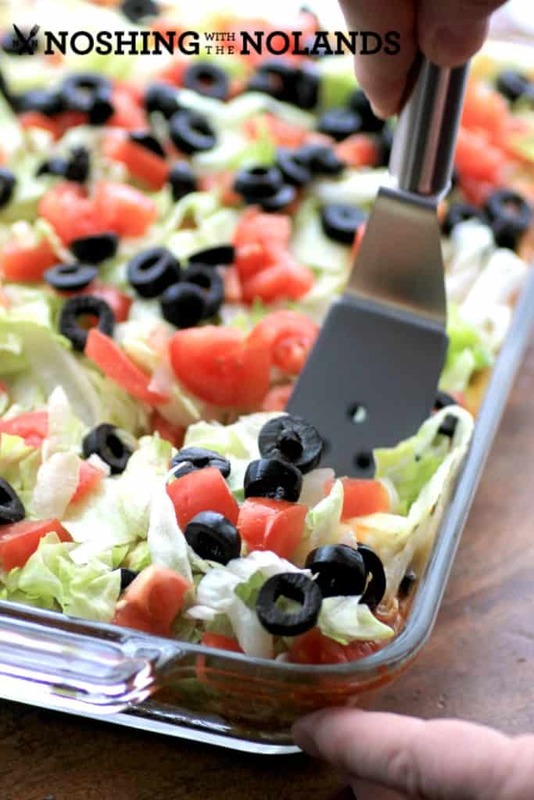 Easy Enchilada Casserole is a great make ahead dish that can be popped in the oven at anytime! Preheat oven to 350F. Spray a 9x13" baking dish with cooking spray. Place 6 tortillas in the bottom, overlapping as needed. Top with one jar of green enchilada sauce, spreading out to the edges. Place on top ½ of the chicken, ⅓ of the cheese and ½ of the onion. Layer on top 6 more tortillas, followed by the red enchilada sauce and then the remaining chicken, ⅓ of the cheese and remaining ½ of the onion. Top again with 6 more tortillas, the other jar of green enchilada sauce and the remaining cheese. Bake in the oven for 30-40 min. until nicely browned on top and bubbling. Let stand for 5-8 min. 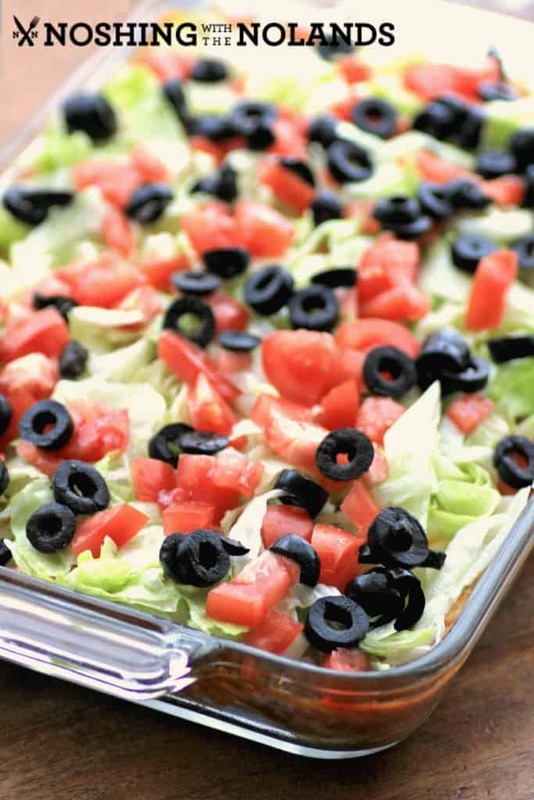 Top with the shredded lettuce, black olives and tomatoes. Cut into squares and serve. Recipe adapted from Enchilada Casserole, 200 Easy Mexican Recipes. All I want for dinner is this now! Yum! Gooey, melty and lots of olives, yes please! What a perfect dish for family dinner! Thanks so much Abigail, we love this easy family meal!! 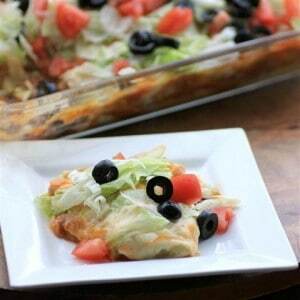 What an easy and wonderful enchilada casserole Tara! This looks absolutely delicious Tara! Wish I could try some now! This looks like a wonderful dinner and I like how you blended the sauce. 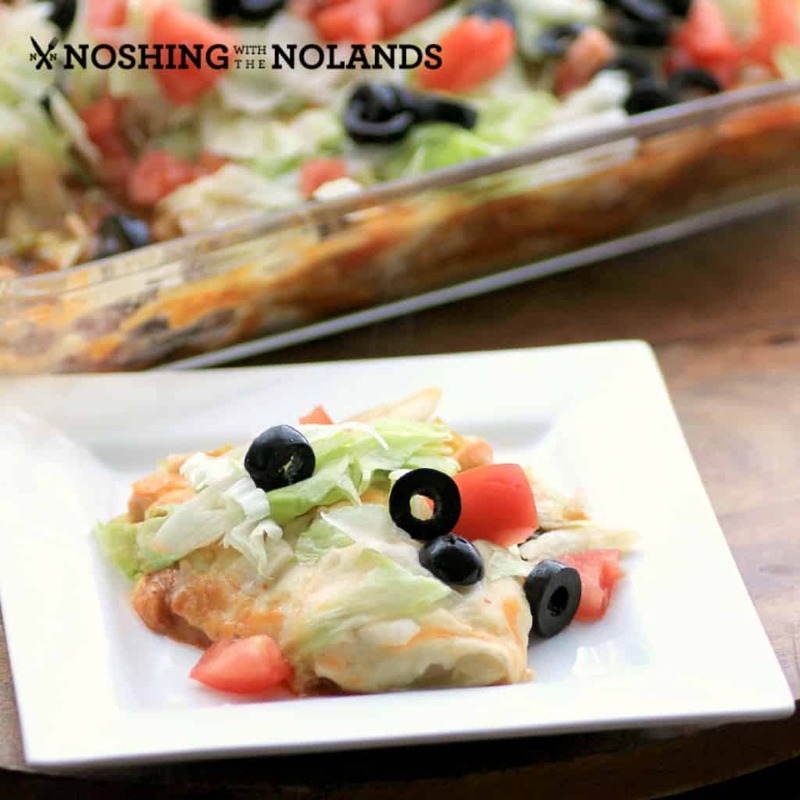 Fantastic enchilada dish here, our kids will love this one, as will their dads! That looks like awesome enchilada casserole! Made me feel so hungry.